IN THE early 1980s master-forger Konrad Kujau above, pulled off a multi-million dollar stunt which went down in history -- he sold seventy-two handwritten Adolf Hitler diaries, which he had laboriously faked, to leading magazines and newspapers around the world including Newsweek, The Sunday Times, and Stern in Germany. 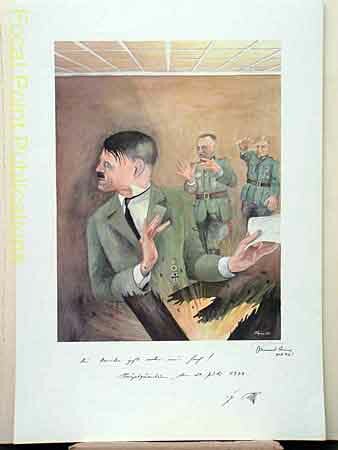 Among the items he sold were also "sketches and paintings by Hitler", which he had also forged. He was a master craftsman, and a competent draughtsman too for that matter. 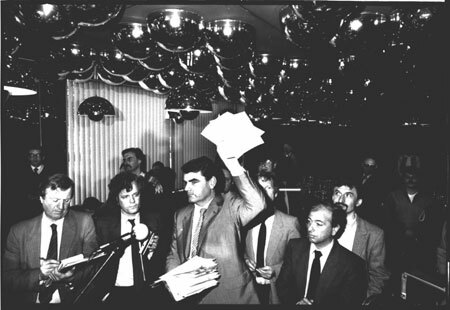 It was David Irving who exposed the fakery at Stern's press conference announcing their scoop in April 1983. After serving his prison sentence for the forgery, Kujau earned a living as an artist, and painted forty ironic lithographs caricaturing the top Nazis. Most have messages and captions in "Hitler's handwriting". The lithos are uniformly 58.5cm high by 41cm wide; one image, No.60, is an oil painting. All are professionally mounted and signed by Kujau. Fast forward to 1992. On October 28, 1992 David Irving was arrested by the Royal Canadian Mounted Police in Victoria, British Columbia, after receiving an award from Canada's George Orwell Society; he had just delivered a lecture on freedom of speech to an audience in Victoria, on Vancouver Island. Ordered by a mainland judge to leave Canada by midnight on November 1, 1992 under a Voluntary Departure agreement, he gathered up his belongings with the assistance of an American stranger, Brian Fisher, an entrepreneur who had offered to drive him back to the island to pick up his belongings. In return, Fisher unexpectedly asked Mr Irving to do him a favour: to countersign the forty original lithographs he had bought from Kujau. Each was signed by the artist, Kujau, and Fisher reasoned that by adding the signature of Mr Irving, the historian who had exposed Kujau's historic fraud at Der Stern's press conference in 1983, he would increase their value. As they drove south down the Interstate, Fisher mentioned one snag: his collection of lithos was in his home, and that was over the border in the US Pacific coast state of Washington. No problem: they drove over in Fisher's blue Lincoln Continental, Irving signed the lithos, phoned friends in Ontario (by Pacific Bell) to organise a huge going-away festival, then drove back into Canada two or three hours later and flew east to Toronto. He had thus inadvertently already complied with the strict requirement that he leave Canadian soil by midnight on November 1 (the law allows a return after that at any time). When that date came, Canadian Immigration officers prevented him from leaving, phoning ahead to the US border officials and asking them to turn him back on a pretext. The unsuspecting US official complied, and Mr Irving was trapped. A two-week trial on Canadian soil ensued, in which he was accused of violating the Voluntary Departure agreement. The penalty if guilty would be permanent deportation. 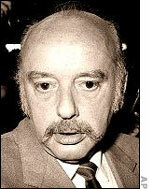 The Judge refused to accept that he had actually left Canada and visited Fisher's home. That would have been "pivotal", he conceded in his judgment. Under orders from Ottawa, he instead found that Irving, Fisher -- whom Mr Irving found and produced in the Ontario courtroom -- and all the other witnesses who had testified by sworn affidavits (including Fisher's wife Helga), had perjured themselves, and that the KUjau litho signatures, the Pacific Bell telephone billing records and even US border computer record had been falsified. Since then Mr Irving has been refused permission to re-enter Canada, and his expulsion has been used by countries around the world to justify his exclusion from them too. Konrad Kujau the artist died in September, 2000. 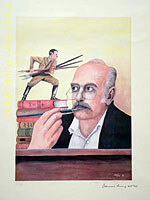 Brian Fisher died in 2008, and his estate is offering the forty historic double-signed lithos for sale. We will accept the highest offer for the complete set which reaches us by October 2, 2009 or we reserve the right to sell them individually (at $500 each including shipping). The complete set can be viewed here [Gallery], and the originals will be on display at the MAX Militaria Show in Monroeville, Pennsylvania, on the weekend of October 1-3, 2009. Each bears the authentic autographs of Konrad Kujau the forger, and of David Irving, the British historian who unmasked him.